The North Platte Public Library’s next Humanities Nebraska program, . “A Visit with Lady Vestey,” will be at 12:00 PM, Thursday, July 12. 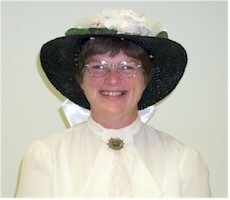 Beverly Beavers comes in costume and character to tell the fascinating story of Lady Vestey. Born in Superior, Nebraska, this young woman became the highest paid woman executive in the world in the early 1900’s. As an employee of the Vestey Cold Storage Company she traveled extensively and learned many languages. She was instrumental in providing food for the Allied troops during World War I and lived in London during the bombing of Britain during World War II. She joined the English nobility when she married her boss, William. Lady Vestey traveled far, but she never found a place that she liked better than Nebraska. This is a program that will be of interest to all ages. All Brown Bag Luncheon programs are free and open to the public. Humanities Nebraska provides the major funding for these programs. It receives support from the National Endowment for the Humanities, the Nebraska State Legislature, the Nebraska Cultural Endowment and private funding. Attendees are welcome to bring their lunches. Water and lemonade will be provided. Seating is limited so please call the library at 535-8036, Ext. 3310 to reserve a seat.